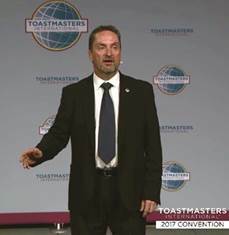 Highway resident and member of the Forest Hills Toastmasters club, Gary Tintinger, recently returned from Vancouver, Canada where he represented Toastmasters District 74 (Southern Africa) in the World Championship of Public Speaking. Club President Jackie Johnson said “We’re extremely proud of Gary’s achievement. It’s a fantastic honour for our club to be represented on the world stage”. Jackie explained that the annual International Speech Contest sees some 30 000 competitors take part in various levels of competition, culminating in the Semi Finals and Finals which are held at the Toastmasters International annual convention, which this year took place in Vancouver, Canada. 100 competitors from around the world compete in the semi-finals with 10 competitors progressing to the finals. The winner of the competition is crowned the World Champion of Public Speaking, this year the honour went to Manoj Vasudevan of Singapore. In the 79 year history of the competition only one South African has every placed in the top 3 of the competition. In 2004 in Reno, Nevada, Douglas Kruger achieved the highest ranking Africa has ever attained at this prestigious contest by placing 2nd in the finals. While he did not make it to the final round of the competition, Gary was happy with his performance and is humbled at the opportunity to represent his country at an international level. “It was an amazing experience, I learned so much.” Said Gary. “As you can imagine the standard of competition is extremely high, but at the same time I realised that it is achievable.” He said. “When I first joined Toastmasters just over a year and a half ago I never thought in my wildest dreams that I’d get the opportunity to compete in the World Championship of Public Speaking, but the opportunity came along and I grabbed it with both hands.” Said Gary. “Above all else the lesson I have learned is to be prepared for your wishes to come true, because it can happen when you least expect.” He said. “It is also extremely humbling and gratifying to be a part of an organisation that is so focussed on the needs of its members” he said. “The moment the local Toastmasters Clubs heard that I’d be representing our District (Southern Africa) they rallied around to offer their support and encouragement. It was a whirlwind of activity and panic getting ready for the competition, organising the visa, flights and accommodation, without the support of my fellow Toastmasters this trip would never have been possible.” Said Gary. “I’m also extremely grateful to the District 74 leadership team who took me under their wing when I arrived in Vancouver. It made the entire experience just a little more memorable knowing that I had a support team around me even though I was many thousands of kilometres away from home.” He said. Toastmasters has been around for more than 84 years and offers a proven and enjoyable way to develop communication and leadership skills. Many people pay high fees for training programs to gain the skill and confidence necessary to face an audience, Toastmasters provides an extremely affordable alternative and is held in high regard in business circles around the world. To find out more about Toastmasters visit www.toastmasters.org or contact Forest Hills Toastmasters via their Facebook page: www.facebook.com/ForestHills.Toastmasters.